High contamination rates got you stumped? Peel Region transitioned from curbside Blue Box service to an automated cart based collection system in January 2016. Cart based service offers residents more storage capacity so they can set out more recyclables. The good news is that the amount of recycling set out by residents has increased; the bad news is so has the amount of unwanted, untargeted items. 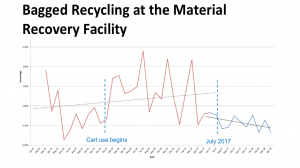 Prior to implementing cart-based collection, recycling contamination was over 10 percent and now, with curbside recycling carts it’s climbed up over 20 percent. Of particular concern is the increase in the amount of recycling entering the MRF in tied off grocery-bags. The small bags can’t be opened with the bag breaker, and manual sorters don’t have time to open them and empty contents so the unopened bags go to the residue bin. The Region not only loses the opportunity to capture and market the recyclables in the bags, but it also incurs an added cost to landfill the materials. Annually 1,500 tonnes of marketable recyclable are sent to landfill in the tied off bags. Digital media to the rescue! Let’s start by explaining what we mean by ‘digital media’. Digital media refers to the communication channels that a municipality exercises control over, such as its website, social media and blogs. 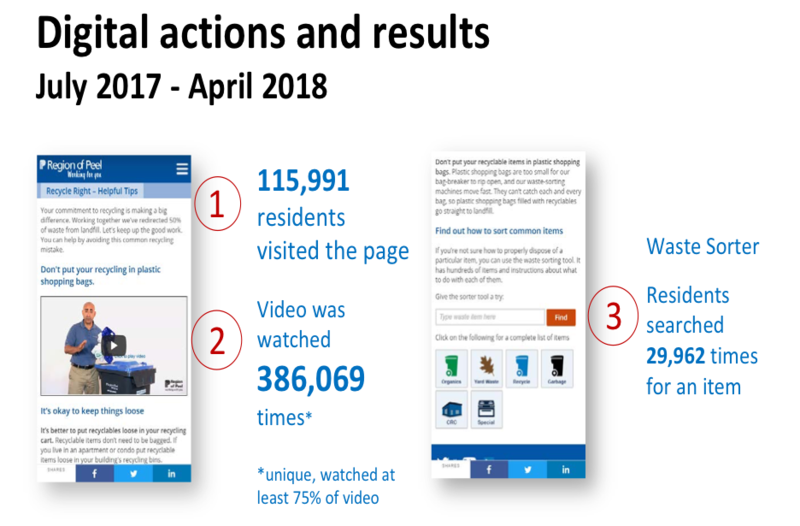 In Peel Region, staff launched a multi-faceted digital campaign focused on one simple message ‘Let them Loose!’ to correct residents’ set out practices. Staff directed several communications channels to a single video landing page to spread the focus of the campaign. Here’s why using digital media works. You own it. You control the messaging and the frequency of the messaging. It’s interactive. You send out your message, and those receiving it can comment. The feedback can be used to fine-tune future messaging based on the insights you’ve gained. It’s a brand builder. Comments shared in a public forum, re-tweets, and re-posted/re-shared ads can inspire or nudge others to take notice of your message. People’s attitudes towards a message are very much influenced by what others have said about it and how many have shared it. It’s cost effective. It does not require the added expense of printing and distribution like traditional campaigns do. It’s responsive. You can get your message or refinements out quickly. No need to wait to produce and distribute hard copies. It’s a stand-alone and a complementary channel. If your story gets covered in the local news you can reach an even wider audience by tweeting links to the story or video clip. Is anybody out there? Who’s getting the message? 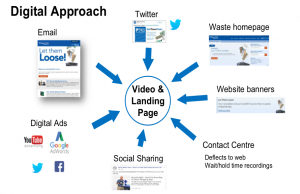 Another advantage to digital campaigns is that they’re easy to track. You can count how many people view an ad, how many comments it receives, and how many times it’s shared, with data available instantly. Here are a few metrics from the Peel campaign. But… did it work? What happened with the grocery bags? Yes, it’s working. In Peel’s case, the digital campaign was a complement to other traditional campaigns running throughout the Region. 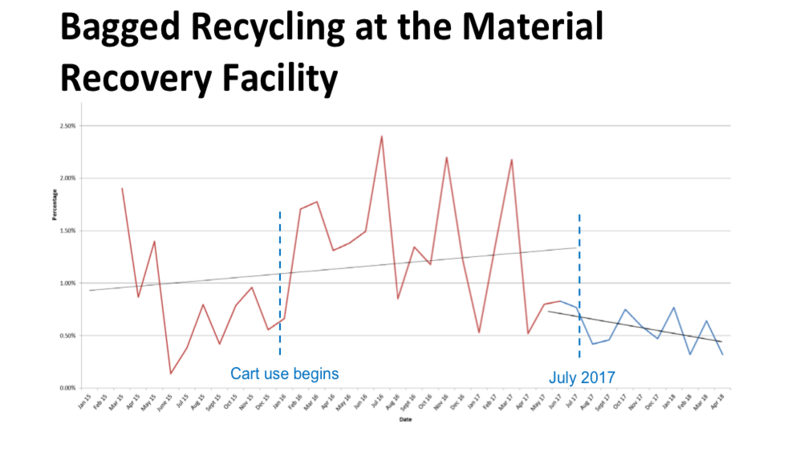 Between July 2017 and April 2018, the combined impact of these efforts was a 50% (near 800 tonne) drop in contamination resulting from tied off grocery bags. This yielded $55,000 in avoided residue costs and $57,000 in added revenues from the sale of materials captured; a positive result on all fronts! For more about this project or advice on how to build a successful P&E Campaign, contact Carrie Nash at cnash@thecif.ca. The CIF is launching a P&E working group to develop tips, resources and case studies like this one to be shared out through the CIF’s Centre of Excellence. Talk to Carrie if you’re interested in taking part!